Photo via Future Farm Project. PENDLETON, Oregon – The Round-Up City is on the map as the birthplace for groundbreaking work in harvesting wine grapes and tree fruit. Jeff Lorton of the Future Farm Project at the Pendleton Unmanned Aircraft System Test Range, says Digital Harvest CEO Young Kim has found a way to mesh virtual reality with robotics to delicately pick the fruit. He said Kim came to Pendleton to work on other UAS projects, but brought the idea for what is now becoming a reality with him. It was developed in an old baggage area at the airport. Lorton says Kim wants to address the dire labor shortage viticulturists and the apple and cherry industries face at harvest time. 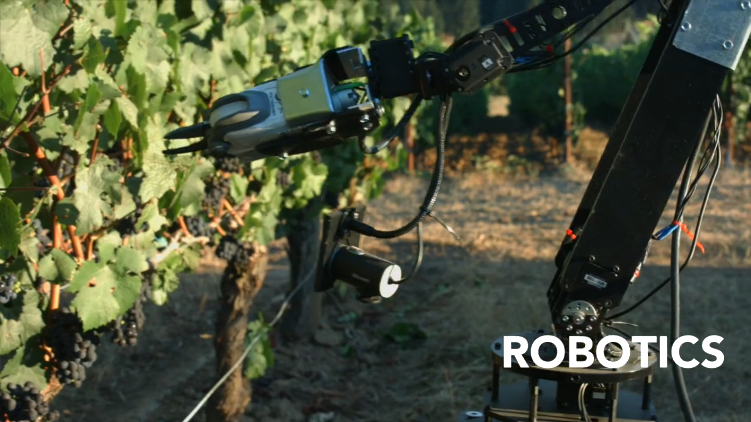 “What if you could bring workers that understood viticulture, and they could teleport through virtual reality into a harvest machine – in this case, the small prototype robot that’s being built right here in Pendleton,” Lorton said. He said the learning curve for using the process isn’t hard, and is actually easy to those who work well with virtual reality. The in-field vehicle is basically a golf cart with a robotic arm. Lorton says the inspiration for the Digital Harvest project was the daVinci ARM, which is used in minimally invasive surgery. He pointed out that while it may be hard to get enough workers to pick the grapes to assemble at the vineyards during harvest, with this process the pickers could be anywhere and it’s a job that could be performed by wounded warriors or pickers working from Australia during their off season.